Buy Konjac Sponge at Wholesale Price from Leading Suppliers of China! When it comes to looking for best skin, and body cleansing sponge, then who can forget a konjac sponge or puff? Made from 100% food-grade konjac dietary fiber, this sponge is best for facial use. All these green eco-friendly products are made from natural food-grade konjac plant. 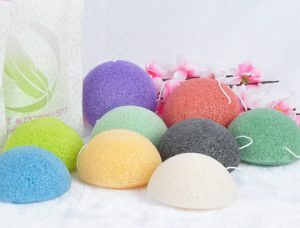 All cosmetic consumers, and beauty product dealers, or those who run Salons and SPA’s, they all look for konjac sponges wholesale, but hardly found it at a reasonable price. But at SOFTCARE, we are providing a wide stock of these makeup sponges at an amazing wholesale prices. So, if you’re running a beauty salon or SPA. Get konjac sponge wholesale from the house of one of the top konjac sponge suppliers of China, to pamper your clients with the quality product through our platform. * Keep the sponge in warm water, and soak it around 5 minutes, then press it a few times to sack the excess water before using. * Scrub it gently in circular motions on the face or body, just like you massage on your face or body. You can also use foam cleanser for best results. * Always keep this konjac sponge into the SOFTCARE self-sealing bag, and store it in the refrigerator to keep it soft and wet. * This konjac sponge is rich in dietary fiber & has super cleansing ability. * This sponge puff can deeply cleanse, moisturize and refresh the skin with the help of its good elasticity and absorptive capacity. * This Konjac puff is extremely soft & 100% safe as it does not contain any artificial preservatives, chemical additives, and any stimulation of the skin. * It is the best facial and cleansing puff for all skin types, as it effectively balance the PH of your user’s skin. As one of the leading konjac sponge suppliers of China, we produce best quality natural sponges made of 100% natural fiber. You can purchase best quality konjac sponge at very reasonable price here.